Discover techniques to calm anxious thoughts, allow your body to rest and repair itself, and experience a fully empowered mind-body-soul connection. Calming My Nervous System is a coaching package designed for individuals who want to learn evidence based techniques to sooth their anxiety driven minds, allow their bodies to rest and repair, and experience fully empowered mind-body-soul connection. ...then Calming My Nervous System coaching package is exactly the right next step towards your true empowerment and vitality. You crave an empowered, healthy mind and body that feels nourished and strong- so that you have the energy and gumption it takes to serve others with your gifts and abilities. But your worries and your fears hold you back. You have been locked in your own mind and your body is beginning to suffer as well. You're exhausted and frustrated that despite everything you've tried, your worries and fears seem to ruin even the most beautiful experiences. You want nothing more than to have a sense of control over your own mind and experiences of life's pleasures and challenges. You lay awake at night worrying about all the ways you could screw things up, even things you know you can't control. You've tried everything you can logically think of to make the negative thoughts go away. You realize if you keep going this way, things are likely to get worse before they get better. You don't have to give up, or continue to live this way forever. You can build the internal resources you need to live a calm, vital and purpose-driven life. To fully engage with life on your terms, free from anxiety and suffering. My name is Becky Palmer, and I know exactly how the darkness of anxiety, worry and fear feel myself. I would love to show you the way out, if you're ready. As a healthcare professional, former military officer, and trained coach- I help people like you transform fear into the focused energy and calmness they desire. I know what you're going through right now. When I started out in health care I was constantly anxious that I wasn't doing the right thing and that I was doing it all wrong. I had a vision of helping people, of being of service, and of promoting healing and wellness. "There has to be a way to feel my true power." But how? I studied. I studied functional medicine to get to the root cause of disease and found out 90% of them are directly related to stress. I became an expert in stress and resiliency. I also studied myself. I spent a lot of money, over 30K, on my own self development. I learned how to feel, how to validate my emotions, how to surrender control, how to transform my health, and how to connect deeply with my body and with others. My life looks very different. I feel a sense of calmness. I feel empowered to respond to life rather than react subconsciously. I choose where I want to direct my energy. I enjoy playful/passionate/ and fun-filled relationships and experiences. I tap into "flow state" and my productivity at work soars. AND NOW I WANT TO HELP YOU ACHIEVE THE SAME SUCCESS. WHY? Well that's easy! Because I believe in your gifts and abilities, and I want to see them fully expressed in the world- not held back by worry and fear. I want to see you in a happy, beautiful and proud body. I want to see you have fulfilling experiences at work and in relationships. I want to see your mind/body/soul thrive! I want to live in a world full of happy, healthy humans! What can I expect from Calm My Nervous System Coaching Package? Develop mindset practices and evidence based techniques that serve you. Leave behind old programming, conditioning, blocks and excuses to discover a whole new side of yourself: empowered and unstoppable. Through coaching and making connections, we literally create new pathways in the brain that serve you. Develop a close and personal relationship with your body so that you can anticipate and deliver your body's needs; relax, rest, repair, nutrition, supplements and movement. This lets you achieve optimal physical wellness, beauty and confidence. Learn to respond to people and situations instead of react. Fully understand your emotions so that you can work with them, and guide them in the direction YOU want them to go. We're all born to give and receive love. You're not meant to go through life alone. We will honor your unique, authentic, and brilliant self- so that you can see it more clearly and then so can others. Personal growth doesn't have to be all work and no play. It can also be fun! Often, when we finally recognize a thought or belief that has been bossing us around for so long, it's ridiculous and hilariously funny! Humor is healing, and we will definitely laugh a lot along the way. After you apply, indicating you are interested in the Calming My Nervous System Coaching Package, we will set up a time to chat and get to know each other. This is important to see if we are a good fit for working together. Before you commit to this life-change process, I want to make sure I can 100% help you achieve the results you desire and deserve. This session is approx 30 minutes and is complimentary. Calm My Nervous System is no ordinary coaching package. It's a transformational deep-dive into how to empower your own mind/body/soul connection. It's an inside job to build resiliency, to create a road-map of your psyche, and to position yourself to succeed. 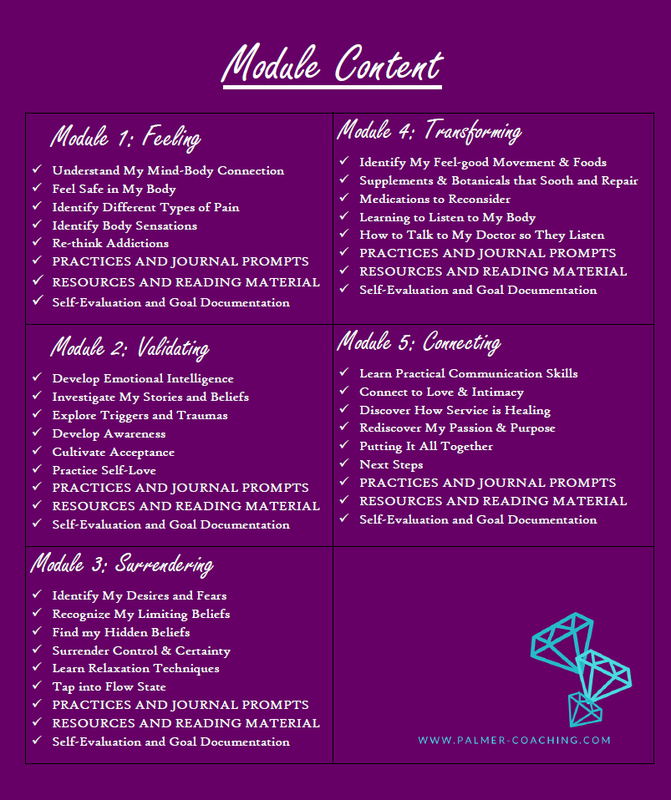 You'll leave with practical tools for calming your nervous system; including practices, evidence based knowledge, supportive self-coaching techniques, and deep personal insights. You will fall in love with you. There is plenty of advice out there that can help you, but none of those modalities take the time to really listen to you, hear you and support you in bursting through the blocks/fears/worries that are holding you back from having what you really want. If you don't do the deep and authentic work of the soul first, none of the tactics and strategies that claim to reduce stress/anxiety will make a difference. When you receive coaching, you'll also connect with the deepest part of yourself- the part that has probably been hiding and self-protecting for quite a long time. Once you also reconnect with the brilliant and empowered side of yourself, you'll be able to move past the fear and lean on your inner strengths when you are presented with opportunities and challenges. In these packages, you'll get more than great information and knowledge. You'll experience a transformation in increasing your emotional wealth and a NEW awareness of your true power. You'll leave knowing you have the internal resources you need to calm your nervous system whenever and where-ever you want, without a doubt! Is Calm My Nervous System Coaching Package for You? What happens if I don't take action now? Or you can put an end to the struggling and join my program- where I'll guide you into learning how to expertly calm your nervous system on YOUR terms. For Questions and to Book an exploratory session, contact me today! New doors were opened for me, after my sessions with Becky, that were never even in view for me before.